WHAT IS 'Full Mouth Teeth in a Day'? A new, simplified solution for the patients who have lost all or most of their teeth. 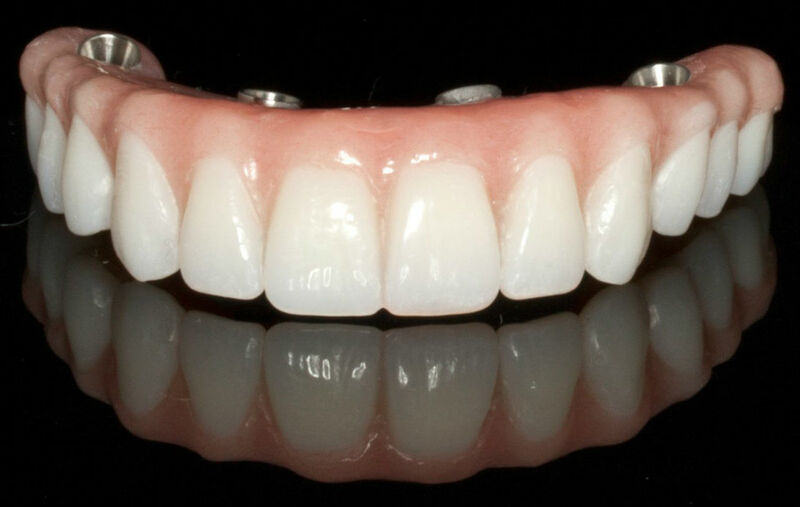 The full-arch rehabilitation provides aesthetic and functional teeth in just one day. The non-removable teeth are fixed permanently on four implants, making 'Teeth in a Day' a most stable and reliable solution for edentulous patients. 'Teeth in a Day' allows the highest rate of success with guaranteed satisfying results. Unlike conventional dentures, 'Teeth in a Day' technology allows you to have a full mouth of permanent teeth that feels and functions like real. Unlike conventional dentures which are large in size and therefore could possibly affect your appearance over time, 'Teeth in a Day' gives you the set of teeth that looks and acts like natural, healthy teeth. Unlike dentures or locators that need lengthy transition period, 'Teeth in a Day' procedure is often completed in a single day as the implants and teeth are inserted on same day. Recovery process is minimized for 'Teeth in a Day' technology. Eat, talk, and socialize as soon as you leave Chrysalis Implant Centre. Bone grafting is a surgical procedure often necessary in a process of building conventional implants. The missing tooth often causes loss of bone underneath and in order to restore this area the bone is taken from your chin or pelvis. With 'Teeth in a Day' you only need minimum number of implants inserted and therefore in most cases bone grafting is not required. Unlike conventional implants that may require 8-10 implants and bone grafting that makes the entire process long and complex, 'Teeth in a Day' has made a revolution by significantly bringing the cost down for more effective and satisfying results. The exact cost varies by patients and their condition but with less number of implants and simpler Teeth-in-a-Day procedure, 'Teeth in a Day' is a definite solution for edentualism. At Burnaby's Chrysalis Dental Centre of Implant Dentists, we are committed to provide the best possible result for our patients. 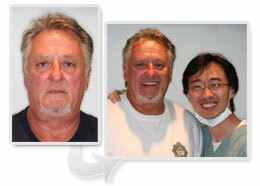 We understand that each patient has different dental history and unique conditions that require attentive care. Please contact us for more information on detailed procedure, number of required visits, and overall cost. 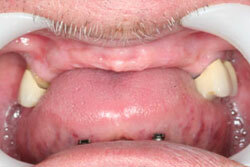 This patient lost most of his teeth and was wearing upper and lower dentures, which were very uncomfortable. 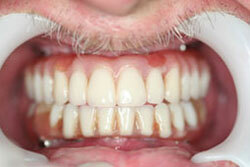 He eagerly wanted to have better teeth and not have to rely on removable dentures. He regained his beautiful smile back in a single day.